When time and heat have deteriorated the mineral wool insulation of your furnace or boiler, it’s time to fill the gap with I-Fix Hot, an easy to-use, cost-effective insulating grout from BNZ Materials, Inc. that helps cool down hot spots to about 200°F and prevents overheating or meltdown. I-Fix Hot allows you to replace insulation that protects the steel shell of your furnace or boiler without having to shut down! It also helps you accomplish the job 10 times faster than you can with any other product of this kind. If that’s not enough, I-Fix Hot costs only 10%-20% of what competing products do, has an unlimited shelf life, and gives you a return-on-investment of 30 days or less. ■ Pumps at rate of 75 cubic feet/hour, 10 times faster than competing products. ■ 10%-20% the cost of competing products. ■ Ships dry in 50lb bags. ■ Mixes to a consistency of 50% solid, 50% water. ■ Does not contain refractory ceramic fiber. ■ Pumps at rate of 8 cubic feet/hour, 10% the rate of I-Fix Hot. ■ 5 – 10 times more expensive than I-Fix Hot. ■ Ships as a liquid in 5-gallon buckets. ■ Mixes to a consistency of 80% water, 20% solid. ■ 6 – 12 month shelf life due to presence of organic materials. ■ Contains refractory ceramic fiber. 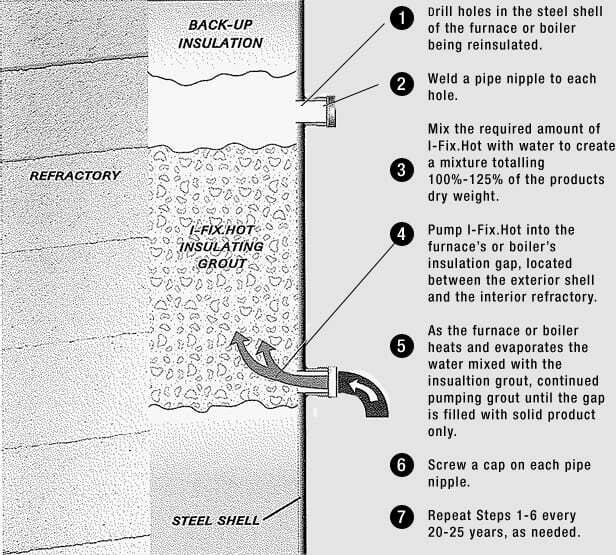 Following a seven-step process, I-Fix Hot can begin to protect your furnace or boiler shell within hours. To replace your deteriorated insulation with I-Fix Hot. 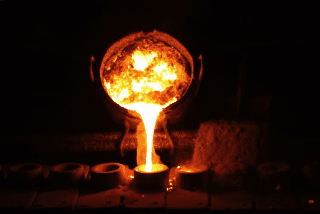 Avoid overheating and oxidizing of metal furnace and boiler shells with I-Fix Hot. New from BNZ Materials, Inc.